On a large piece of parchment paper, use a marker to trace or draw an outline of the United States to roughly fit about 11x17 inches. Place the parchment on a large baking sheet. Preheat oven to 350°F. In a large bowl, mix together sugar cookie mix and flour until well combined. Press cookie dough onto the parchment paper, molding the dough around the edges of the outline to make the dough in the shape of the United States. The dough should be about 1/4-inch thick. Bake the large United States cookie for 10-16 minutes, or until the edges are golden brown. Frost the cookie with Betty Crocker vanilla frosting, filling in to within 1/4-inch of the edges. With a butter knife, draw the lines for the flag, with stripes approximately 1/4-inch apart, and a box for the stars in the upper left corner. Place red & white candies horizontally across the flag to make the stripes. Press white and blue candies in the upper left corner for the stars area of the flag. Cut or break apart to serve. 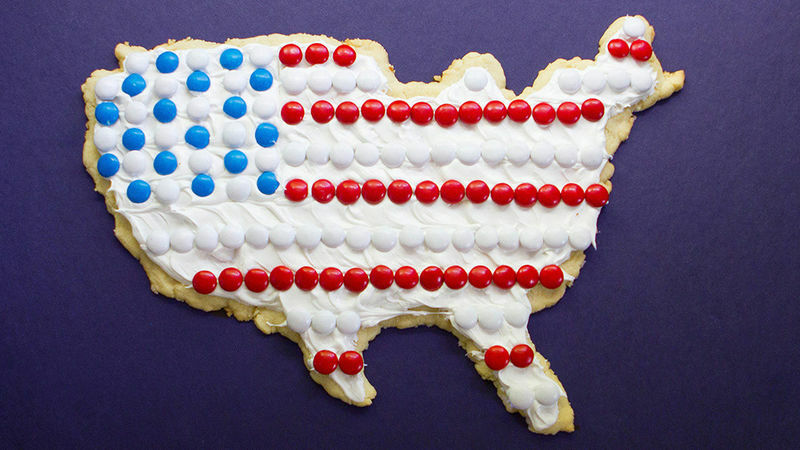 For the 4th of July or any patriotic holiday, this big flag cookie will turn heads and make smiles. I dream of being a Pinterest mom, but the fact of the matter is, there’s no time. While some people can spend half a day crafting mason jar treats with crystal knobs, I’m generally feeling amazing if I get kids washed and fed before work hits, dinner is desired, and bedtime comes ‘round. If you’re always wanting to make adorable things for parties and such, but never seem to have the time, THIS GIANT COOKIE IS FOR YOU! So easy, it takes just 4 basic ingredients. So simple, it takes under 30 minutes to prep, shape, and bake. So adorable, you may just become a Pinterest doll, after all! And how fun is this for the holiday picnic? Let's do it. Draw the outline of an American Flag backwards on the back of a piece of parchment so it shows correctly when the parchment is right-side up. Trace it from another sheet, or hand-draw it backwards on the back -- just make it look kinda-sorta like the good ol' U.S. of A. That was the hardest part. Now you're home-free. Get out your cookie dough and mix it with a bit of flour. With your parchment on a large baking sheet, mold Pillsbury Cookie dough inside the outline. Fill it all in 'til it looks right. Bake until golden delicious. Cool completely. Fill the frosting in to within a smidgeon of the edge. Use a table knife to draw the lines of where your American flag will be. Draw a little square area for the stars, and lines where the stripes will go. Colorful candies are needed now! You’re almost there. Just place 'em where you need them. Nibble a few along the way. No harm, no foul. Colored candy-coated chocolates can be purchased online, or at many party stores. And just like that ... Oh beautiful, for spacious cookie! Tote to a party, gleam with pride!